Say what you want about how The Dark Knight Rises capped off Christopher Nolan’s trilogy, but I really dug how some of the characters were portrayed. Granted, Bane and Catwoman’s appearances were a bit different from what we’ve grown accustomed to seeing in the comics, but I believe that their characterizations were quite spot on. Really, this especially applies in the case of Anne Hathaway’s Selina Kyle. Think about it: Before 2012, no film had really accurately portrayed the morally ambiguous jewelry thief in an accurate sense. While Tim Burton’s vision brought us Michelle Pfeiffer’s awesome iteration back in 1992’s Batman Returns (the less said about Halle Berry’s, the better), it was exactly that – Tim Burton’s vision. But, thanks to Hathaway, we were finally able to welcome the feline fatale that’s been toeing the line between hero and villain in comics, animation and gaming for the past 25 years or so to live action cinema. Aside from looking like a high-tech Julie Newmar, it was pretty much the way I’d been waiting for Catwoman to be depicted on film. That being said, I still am wishing to see the zip-up bodysuit and goggles much like many of you with the next hopeful iteration. Funny enough, it seems like all the right people are reminiscing about Rises in recent memory. Just last week, Joseph Gordon-Levitt, Robin John Blake himself, celebrated Throwback Thursday in style by posting an old photo he was in with co-stars Christian Bale and Tom Hardy. 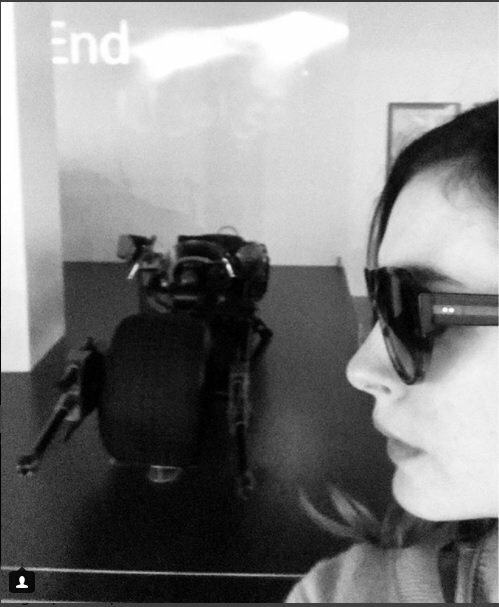 This time, though, it’s Hathaway herself waxing nostalgia by posting a pic from her recent trip to the Petersen Automotive Museum on Instagram. Captioned with “Hello, old friend…,” she can be seen in the gallery above reuniting with the Batpod from The Dark Knight Rises. If you’ll recall, she played one of the few characters other than Batman himself to have taken such a vehicle for a spin, so this photo is definitely a cool little nod to her role.